Who would’ve thought you could make stuffed peppers and have them on the table in about 30 minutes? Not me. A few weeks ago I was staring into the fridge at 5:15, once again, wondering what on earth was I going to feed my family for dinner. 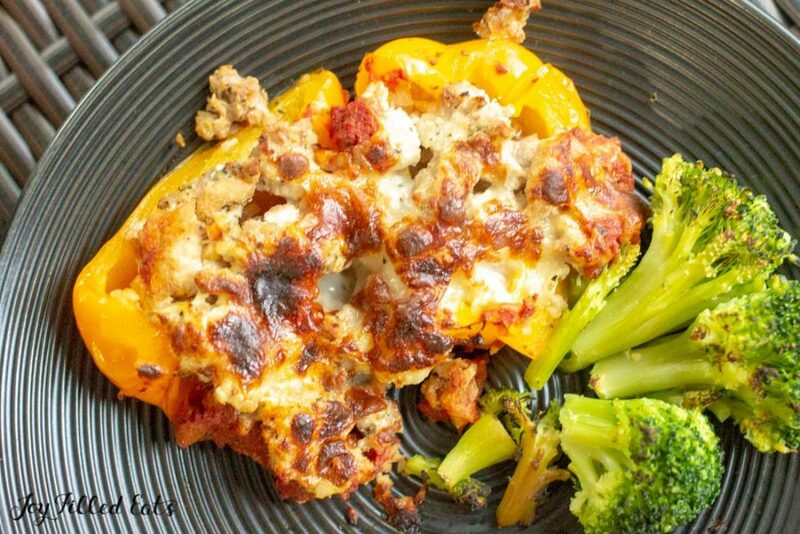 I had some ground turkey and I had some peppers that were beginning to get a little wrinkly so a stuffed pepper recipe was the way to go. But if 6 pm rolls around and dinner is not on the table my little ones get HANGRY. And my husband. (Shhh). 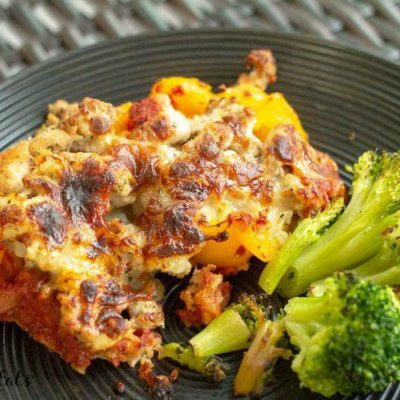 So I decided to turn traditional stuffed peppers into a fast and easy stuffed pepper casserole! Step 1: Put seeded and quartered peppers into a large casserole dish. Cover with foil. 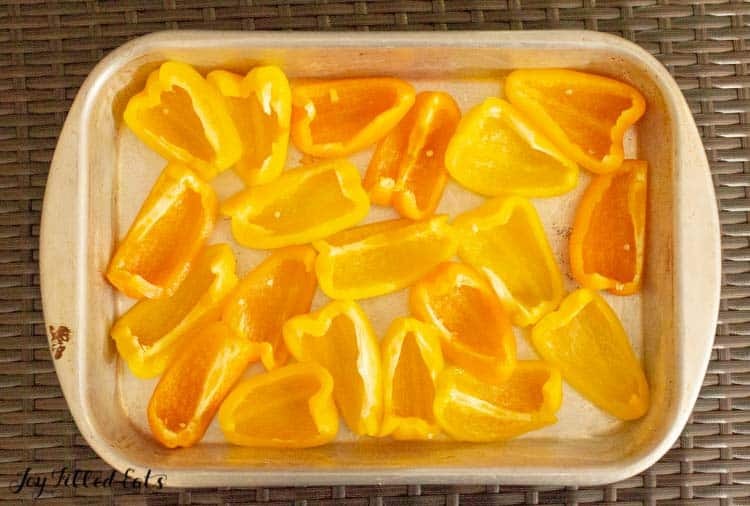 Bake for 20 minutes to soften. 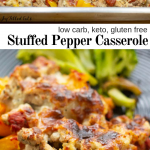 Since traditional stuffed peppers have white rice most of the time I subbed in cauliflower rice to keep this recipe low carb. Step 2: While the peppers are softening brown the meat, add the cauliflower rice and add the seasonings. 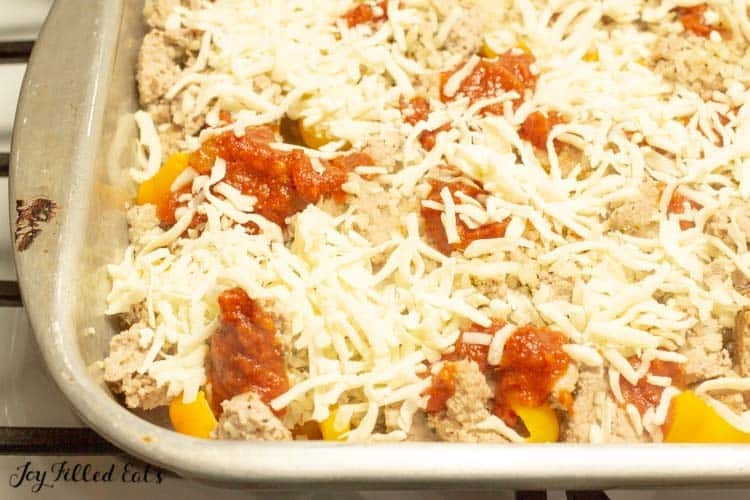 I use ground turkey in my Stuffed Pepper Casserole because it is a lot cheaper than beef and my kids can’t tell the difference. If you prefer to use beef or pork (or a combination) go ahead. 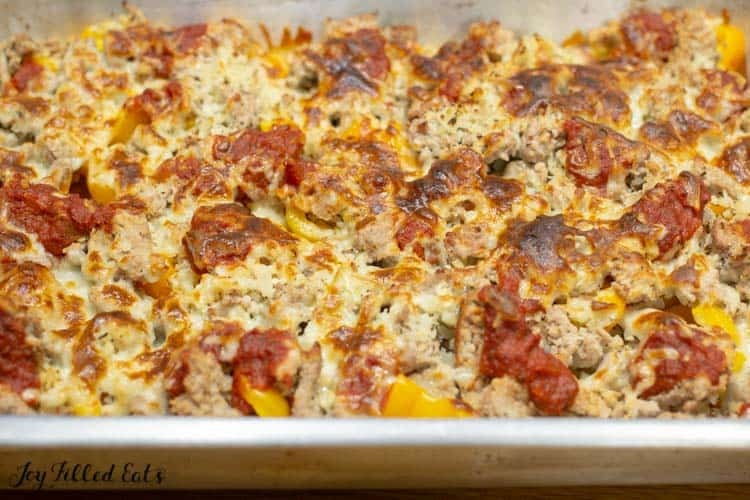 I use a combo of ground turkey and sausage in my meatball casserole and that is an excellent combination as well. Step 3: Put the browned meat on top of the softened peppers. Top with a little marinara sauce and mozzarella. Bake for 10 minutes until the cheese melts. If you like your cheese browned you can then broil this for a minute or two. 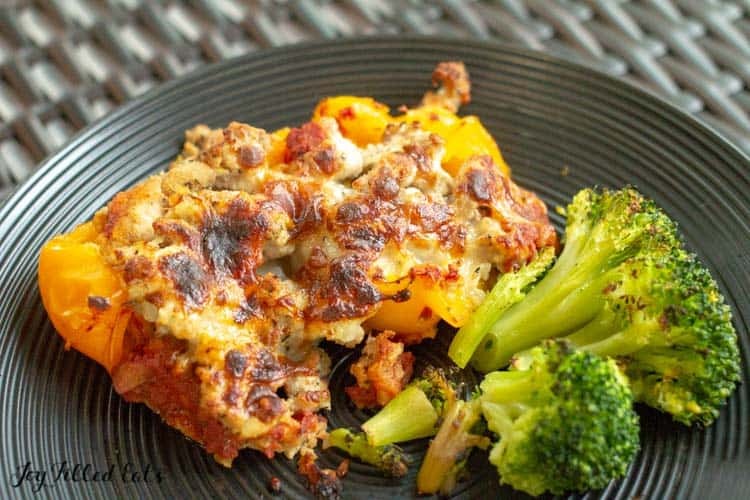 I served my stuffed pepper casserole with broccoli but any green vegetable goes great with this. We also love it paired with Caesar salad. Whenever it is safe to eat romaine lettuce, that is. This summer I will definitely grow my own. There are just too many recalls and we miss my Caesar salad when we can’t eat romaine. 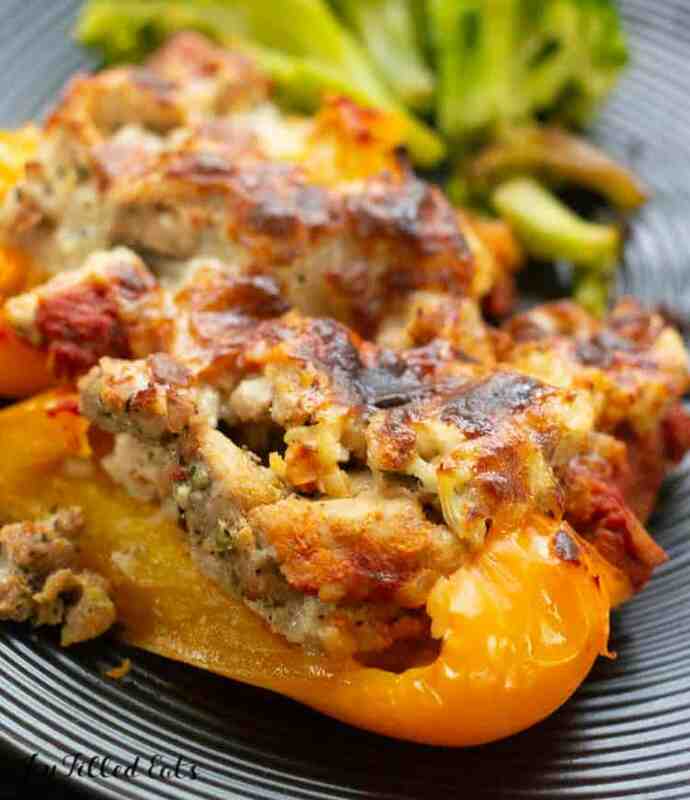 For a more traditional stuffed pepper recipe try my White Lasagna Stuffed Peppers. They have only a 5-minute hands-on time! 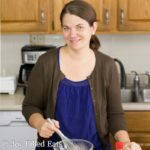 If you have less prep time but more time before they need to be on the table that recipe is a great one. Preheat the oven to 400. Spray a large casserole dish with cooking spray and add the peppers. Cover with foil. Bake for 20 minutes. Meanwhile, brown the meat in a large frying pan. 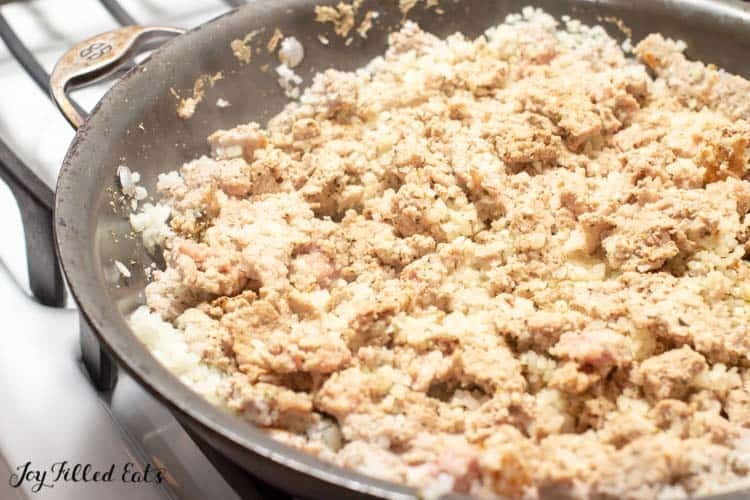 Add the cauliflower rice and seasonings. After the peppers have baked for 20 minutes remove the pan from the oven. Top the peppers with the cooked meat. Drizzle on the marinara sauce and sprinkle with the cheese. Bake uncovered for 10 minutes or until the cheese melts. Optional: Broil for 2-3 minutes to brown the cheese. I have this in the oven now! I only had three peppers and 19 Oz of ground turkey. I added a bit of red pepper flakes for a kick and put pepperoni on top before adding the cheese so this is kind of like a pizza stuffed pepper! I see amount for serving. What is a serving size for this? 1/8th of the casserole. This equals 1/2 of a pepper with the toppings. 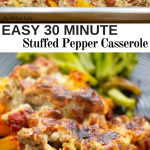 Just tried this using sausage and it was delicious! Thank you! This looks amazing! I'm making it tonight!